According to the counter on the front page of the App Store, Apple passed the one billion mark just before two o’clock today. Whoever won the title of billionth download will be making off like a bandit: The Cupertino company will be contacting them to deliver a 17″ MacBook Pro, a 32GB iPod touch, a Time Capsule, and an iTunes Gift Certificate worth $10,000. Reaching a billion downloads so quickly is impressive: the App Store has only been open since July 10 of last year. 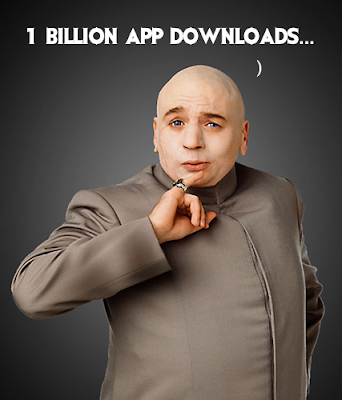 That means it’s averaged 3.5 million app downloads a day, a rate of adoption many other services could only dream of. If we divide the total number of apps by the 30 million iPod/iTouch devices in use (the number Apple gave us in March), then users are downloading an average of 33 applications each. It’s really hard to judge App Store revenue. Apple doesn’t generally disclose such information, however, it’s not too hard to imagine the company is making tens of millions of dollars per month off the App Store based on what Steve Jobs shared with us about its initial successes last August. And to think this was a market that almost went untapped. Its amazing how Apple has revolutionise the whole business of mobile device, mobile internet and now mobile apps.